Enter Mr. Snively. As a private citizen, Samuel Snively had donated to the city, Snively Road (later known as Seven Bridges Road), the east-end parkway he had built near his back-country farm above Duluth. But it was as mayor that he would achieve his greatest work in road and park building. During his sixteen years in office, Snively did more than any other individual to expand and promote the city's boulevards and parks, especially the hilltop drive. Snively was sixty-one years old when he was elected to the office, and his first proclamation as mayor was his promise to make Duluth the most beautiful city in the Northwest, if not the country. The completion of William Rogers's original park plan was a major goal of his administration; the hilltop Boulevard, in particular, became Snively's personal project, one he continued to work on for practically the rest of his long life. 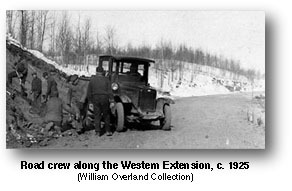 During the 1920's, Snively pushed to expand the Boulevard westward from Oneota (it's terminus at the time) all the way to Jay Cooke State Park. The Lake Superior International Highway along the North Shore and into Canada was nearing completion, and Snively saw Duluth's Boulevard as an essential link of a larger highway system connecting Duluth with Minneapolis and St. Paul and Port Arthur and Fort Williams. Early mornings the Mayor would often show up at construction sites clad in work overhauls and ready to join in with the manual labor of building the drive. Due to Snively's persistence, the Boulevard extended far beyond Bardon's Peak to the west, descending into Mission Creek valley, and all the way to Fond du Lac. By 1926, only the mile and a half of linking road through Jay Cooke State Park remained to be built. This final link was completed by early the following year. Dignitaries from around the state were present in Fond du Lac when the entire boulevard system was dedicated, and re-christened Skyline Parkway on the 3rd of August, 1929. Five years later, Mayor Snively would begin construction of what would be his last major road project, and the final major addition to Skyline Parkway, the extension across Hawk Ridge of his original road along Amity creek. Work on that portion was still being completed two years after Snively was voted out of office in 1937. It should be mentioned that Rogers's plan for a parallel parkway along the present day lakeshore never really attracted as much attention as the upper boulevard. However, a segment of the lower component of the plan was realized when Lakeshore Park (later Leif Erikson Park) was constructed along London Road near 12th Avenue East during Snively's second term. But it would be another six decades before the Downtown Lakewalk would be built. This popular pedestrian, biking, and skating route follows Lake Superior's shoreline from Canal Park to 26th Avenue East, and is certainly in the spirit of Rogers's original plan. Today, Skyline Parkway skirts twenty-five miles across the hilltops of Duluth from it's terminus at Becks Road in the west, to Seven Bridges Road in the east. 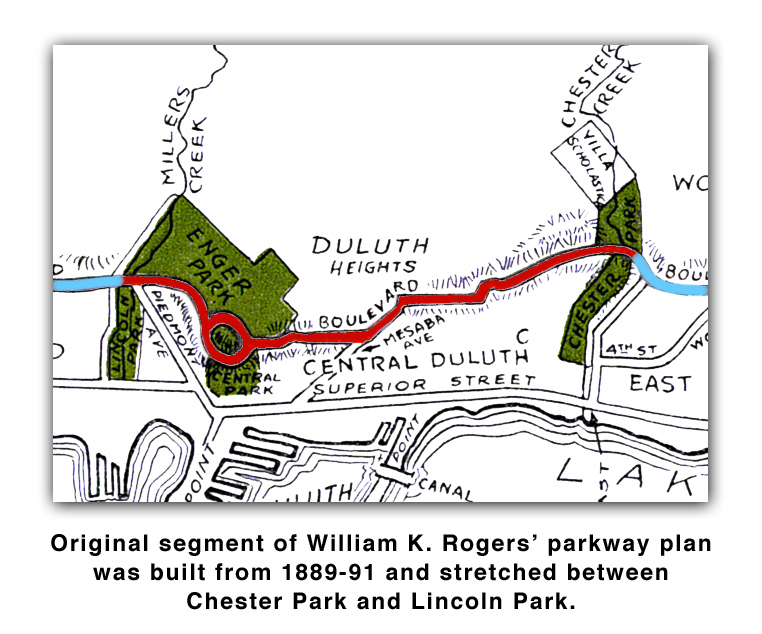 The vistas presented of Lake Superior, Duluth, and surrounding lakehead region are still as thrilling and breathtaking today, as they were back when William K. Rogers first conceived the highland boulevard. Web Pages © 1999 Mark Ryan. All color photographs by Mark Ryan. © 1998, 1999 Mark Ryan. 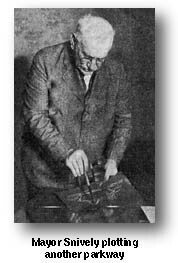 Photographs credited to William Overland Collection or to Douglas Overland Collection are © William Overland, and © Douglas Overland, respectively.